I’ve just acquired the tiniest deck in my historical facsimile collection — a miniature version (1-1/8 x 2-¼ inches) of Il Meneghello’s reproduction of a TdM printed in Bologna in 1780 by Giacomo Zoni. Lo Scarabeo also publishes a facsimile. 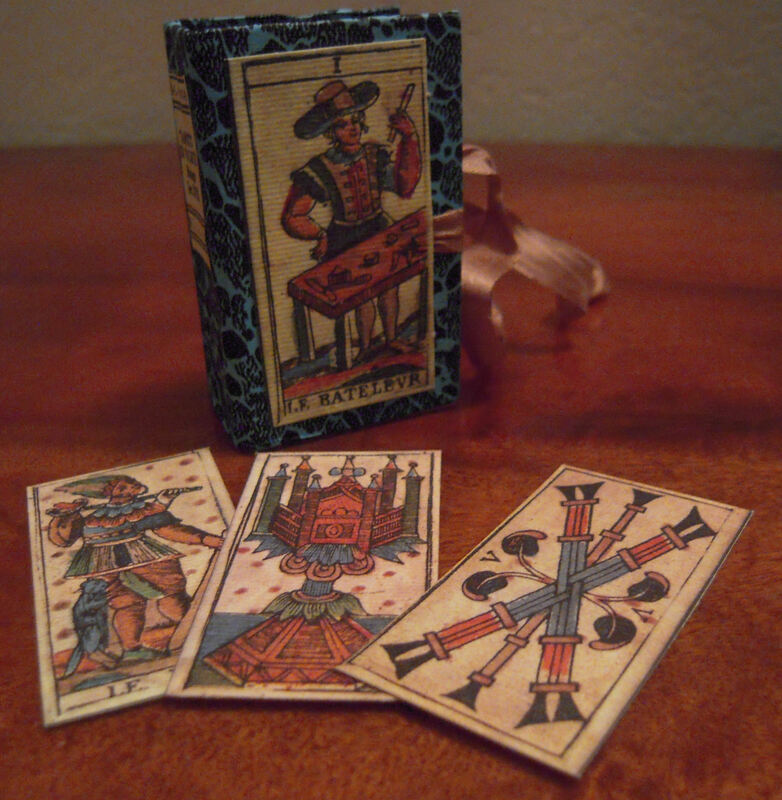 Shown above is a mini card superimposed on the Lo Scarabeo, which is a bit larger than Il Meneghello’s full-size version. The Lo Scarabeo deck is lighter and brighter than the Il Meneghello. Mercifully, they’ve omitted the card names in five languages that usually clutter their borders. The border is a soft gray-green which blends well with the deck. I’ve heard they also have version with a blue border decorated with blue dots. Speaking of dots, this deck is covered with them. The cards look like they have chickenpox. I have assumed this was damage from aging, but in some cards the dots are placed too regularly or symmetrically to be random damage. Also, the dots are too round and similar in size; they don’t resemble the usual splotches and stains you get on these very old decks. Compare the random dots on the Three of Coins to the dots marching up the sword blade. There’s another Bolognese deck, from 1725, with the same type of dots, the Geographia Tarocchi in Kaplan Volume I page 147. I can’t imagine why someone would put those dots on the cards deliberately. Did they really think they were enhancing the deck? Does anyone have a theory about them? This deck is historically interesting because it comes from Bologna but is not a Bolognese deck with the four Moors and shortened numerical suits. Since the card titles are in French, it was most likely made for export. There’s a lot I like about this deck. The faces are lively and intelligent. The rich colors are mostly teal blue, green, antique gold and rust. It comes in the usual Il Meneghello box covered in handmade paper and with a card glued to the top. The dots really put me off, but in the tiny deck they’re less intrusive. I’ve been wanting a very small, light TdM to carry around with me, and this might be the one. Tarocco di 78 Carte, Bologna Sec. XVIII, Il Meneghello, Milano. The deck does not have the usual enclosed card giving the date and the number of decks printed. Ancient Tarots of Bologna, Lo Scarabeo, Torino, 2000. Quite interesting commentary here! This really is a small deck! I would like to hear what the dots are all about too. These red dot are very common on decks made in Central Italy (Bologna, Florence, Rome) ranging from the 17th to the early 19th Century. The best example is the Minchiate Al Leone, but many other decks have them more or less pronounced. To list some decks, mid 18th Century Tarocchino from Antonio de Maria (Bologna), 1763 Minchate Gaetana (Bologna), Minchiate Poverino and Minchate Etruria, bot from 18th Century Florence, a 1823 Minchiate deck made in Rome, and several Tarocchi decks (David Berti, Angelo Valla, Giuseppe Smit, Francesco Berti and a Tarocchi deck made in Gorizia). Other decks are using the same red ink to decorate the cards, like the 17th Century Tarocchino deck that is conserved in the French National Library. I really don’t have a clue, but I suppose that the dots are only there for decorative purposes. Thanks so much, Iolon, for the information. I had no idea the dots were on so many decks. Personally, I think they’re ugly. I suppose they all had to be applied individually. I can picture some bored apprentice sitting in the corner of the print shop with a brush and a pot of rust colored ink spending hours marking up the cards with those silly dots. I had wondered if the publisher, reissuing these cards, dropped oil randomly on the paper to make it appear more ancient and thereby more authentic. I agree, I can’t stand them. People have brought several historic decks to my attention that have the same red dots. It seems to have been a fad back then. I think they’re ugly, but they’re genuine, not a trick to age the cards.